This is classic Chardonnay with just a kiss of oak. Half bottles are perfect for any occasion! Our estate is bordered by the Russian River and since 1975 our Estate Chardonnay has highlighted the gravelly river banks where it is grown. The vines are planted on some of the coolest sites on our estate where morning fog is the norm, and the temperature might drop between 40 to 50 degrees from day to night. We harvest 70% of our Chardonnay at night when the grapes are cool to retain the natural acidity, then cold ferment those lots in stainless steel, without malolactic fermentation or barrel aging, to highlight the citrus and green apple flavors. To add balance to the wine, we whole-cluster press 30% of hte best fruit and barrel ferment that portion in French oak barrels. The barrel fermented lots alsow underwent secondary malolactic fermentation and aged on the lees for six to eight months to develop roundness and body. 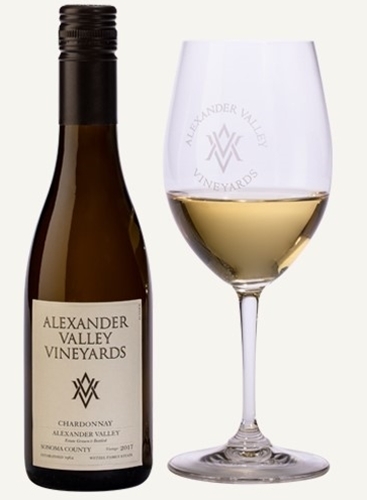 There are fresh fruit aromas of apple pear, pineapple, and vanilla mixed with floral notes and slight oak in the glass. The 2017 is rich and full bodied with slight citrus notes along with fresh fruit flavors of pear, apple tropical fruits and peaches. The Viognier adds a slight floral component and contributes to the rich mouth-feel. This vintage is well balanced and has a very long finish.